The whole point of what we do is to build better athletes. We’re just talking about philosophies, but there’s a bigger picture behind this whole endeavor. It’s about people and character and work ethic and the qualities that we will transfer in life. It’s not even talking about the sport anymore. The end result is that we want to elevate; we want to try to create this great, positive feeling with our athletes. In creating a program, we have to create a needs analysis. What do we need? Strength, power, sports reactivity . . . lean body mass? If the program is sound, it’s going to have injury prevention as one of the top things on the list. We can’t play a sport without that. And as far as functional goes, if what we’re doing doesn’t translate at some point, whether on the field, the court or whatever we need to do in life, it’s not functional. We train really hard and sometimes people don’t understand what I mean by that. By “really hard,” I mean it’s like questioning why you came—it’s hard. That’s how it is every single day for all of our sports. There’s really nothing like it. There’s a common bond that we’ve all been through this anguish together. To program well, you need know the demands of that sport. It’s easy: Just look at it and watch. Watch a volleyball match or a soccer match, and don’t look at anything but what their feet are doing. There’s a lot of reaction in a small space. So why are you running them a mile? That doesn’t make sense. Why are you not doing power or reactivity? Once we get to the weight room, we do what we call a ‘poor man’s activation.’ We foam roll and do a set of Turkish getups, three on each side. We do our getups and then we get on the platforms and do a quick barbell complex warmup, which is really simple, and then we get in Olympic lifts. We do our strength training, which is going to be full-body. If it’s football and we have the luxury of having four days a week, we do kind of a push/pull sequence. We do some kind of core; we do some kind of finisher depending on what time of year and we do a little self stretch with the bands. That’s it. You need to have a training philosophy. You have to have something to hang onto. It’s your foundation. It doesn’t matter what it is. This is my philosophy: work capacity. If I can build work capacity, I’m going to get progress. Don’t buy into the whole thing about there being a quicker way from A to Z. Exercise physiology 101: The first thing you learn is called the overload principle. Without overload, there’s no progress at all. If somebody tells you there’s a better way to get there without pushing and overloading and pain and anguish, it doesn’t work. It’s not going to work you’re going to end up going back to overload no that matter what. My focus is work capacity; that’s first and foremost. Now, what it takes to get there, don’t confuse that—don’t confuse your philosophy with your tools. Philosophy comes first, then come the many tools in our toolbox. Don’t confuse those with philosophy. Your job is to make them fit your plan for what you want to get done. In my case, I want to bullet-proof the athletes. We’ve got all these tools. You have a toolbox of TRXs, kettlebells, Olympic lifts . . . all these things. But don’t be a dabbler. Where does each thing fit in? If you haven’t used a tool in your last training cycle (for us it’s three weeks,) get rid of the tool. Get rid of it because it’s not important to you. Once you grab a sandbag and you get education behind it and understand what you can do with that sand bag, it’ll be part of your toolbox. It’s an amazing tool. Am I an Olympic lifting guy? Yeah, all of them. These are great tools. The TRX is amazing for us. 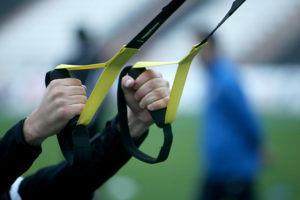 Think about horizontal pulling with a TRX. It’s a tool that’s part of what we do. Yes, I am all of those things. These are the types of things we should we should look at when we when we create a program. It’s just like the old “power to the fourth” thing: bodyweight, setting your feet, Olympic lifts, explosive exercises when you can, free weights. The “eights” are really important—forced development. People don’t really understand that sometimes. The whole reason we use Olympic lifts is for that movement. I don’t care if you’re doing it via actual cleans or just jump shrugs or clean pulls. It doesn’t matter. If I can physically, forcibly get you to quadruple extend— more than triple extend. Quadruple extend will really get that going. It’s going to transfer into everything we do. 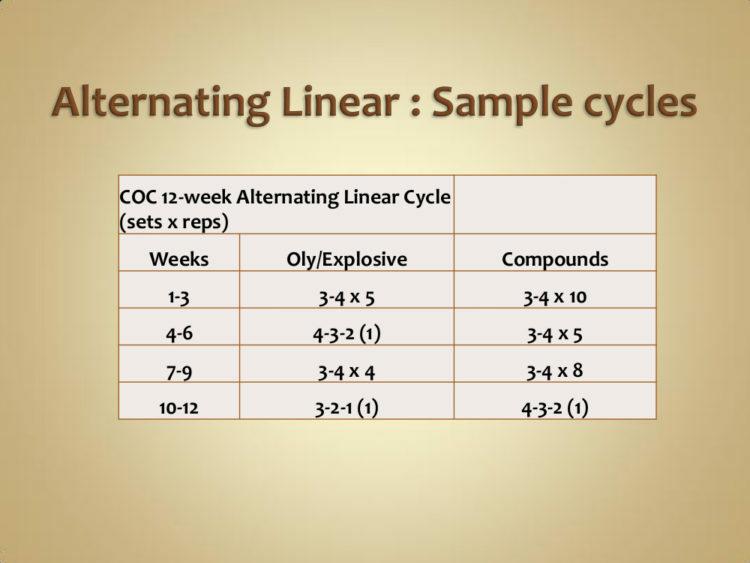 We understand the concept of linear versus undulating periodization. People like this. Research says undulating works, and yes, it does. But don’t tell me that linear periodization doesn’t work. I only used this for about 15 years. It works because we go hard and heavy. We have a systematic approach to it and it works. Is there a better way to go? Maybe. The old concept of having a hypertrophy phase, a strength phase, a peaking face, you have an in-season phase—there are some glitches with those. From 1989 to 2004, I was a linear periodization guy. That’s what I did and it worked. We cranked down some monsters, NFL guys, Major League Baseball guys. 2005 to the present, I do an alternating linear program. This is something Alwyn Cosgrove came up with. It’s not exactly undulating, where basically from workout to workout we change up the reps, the volume, the loads. We’re going to sit into a scheme for about two or three weeks, then we’re going to change. We’re always going to like a higher volume hypertrophy to a strength/power deal . . . every three weeks . . . no matter what. This is how it looks now. 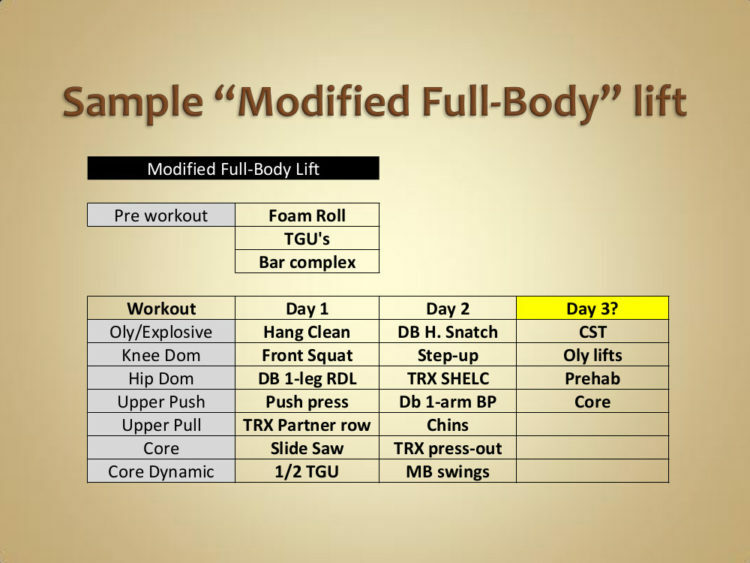 We basically go from a hypertrophy to a strength sequence, back and forth. It doesn’t matter what the sport is; it doesn’t matter what time of year it is. Right now, we’re all on this. Everybody’s on it. As I’m writing this, football is in season; basketball’s preseason; baseball’s offseason and we’re all in week one to three right now. We’re all doing that right now. If it’s playoff time and I’m moving into a hypertrophy phase, so be it. Here’s our average session: 15 to 20 sets per session. That’s all we do. That’s it—35 minutes for small groups. Football takes longer because there are a lot of guys—around 100 plus guys through there. Intensity is high and tempo is fast. We really make them focus. If the focus is not good, I institute the rule that we turn the music off and are not allowed to talk. We just go—I just want to hear ventilation and nothing else. We don’t do any slow concentrics. There’s no such thing as slow speed. We do everything fast from coming out of a squat, coming out of step up, up with a bench press—everything’s fast in the concentric. We might do some slow eccentrics or some pauses on a static hold to stay in our rep range, but in general we’re going to do concentrics very fast. We do our foam rolling and our TGUs. Bang! There it goes: Hang cleans. We do a hip and a knee-dominant exercise. We do a push and a pull, a core. We kind of pair up a core, like a stabilization core and then a dynamic core, which might be like medicine ball wall swings and maybe something like anti-extension of like Val slide saws. Then, it might be a half-getup, a really heavy half TGU to the palm and then band presses, working that anti-rotation. We pick those up and we superset everything. Having a third day provides me a little more ability. If it’s a group that needs to do a little more conditioning, we’ll do more conditioning that day. 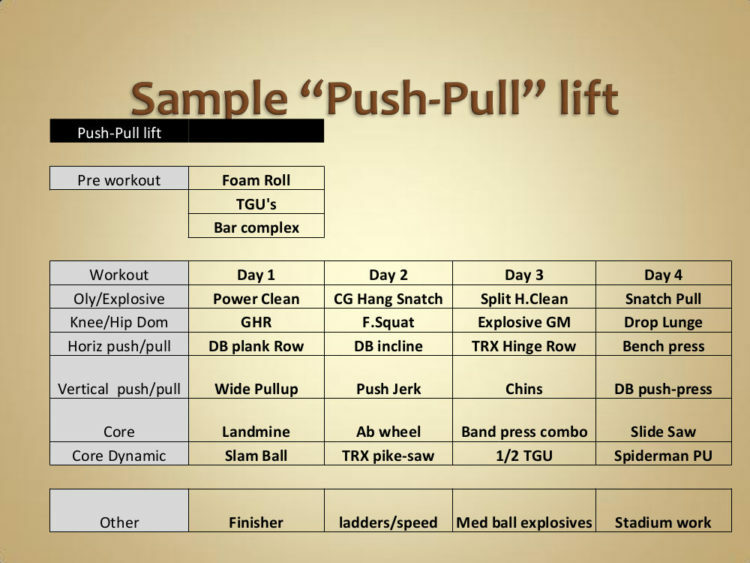 Or maybe working on some Olympic lifts, maybe some prehab stuff, maybe some ladder work. We also do a bilateral and unilateral combinations. We’re going to try to do that with bench and everything. Everything we do—we do push press one time, then we’ll do single-arm double jerks or something to match it. We don’t pair our Olympic lifts with anything; we just concentrate on those big lifts. Depending on what our sequence is, whatever it is, we lift heavy. It’s simple stuff; it’s not rocket science, but we’re addressing everything. We just create an environment where we’re going to learn the lifts, we’re going to do them right and then we’re going to get stronger. We’re not going to be afraid to get stronger. Coach Robert dos Remedios has been involved in strength and conditioning for over 27 years. After completing his competitive football career at the University of California, Berkeley, he began training athletes on a full-time basis. “Coach Dos” has a Master’s Degree in Kinesiology from California State University, Northridge, has been a Certified Strength and Conditioning Specialist (CSCS) with the NSCA since 1990, and is one of only 100 “Master Strength & Conditioning Coaches” (MSCC) in the world as recognized by CSCCa. Coach Dos is a sought after international speaker on a variety of conditioning topics such as Program Design, Cardio-Strength Training, Olympic Weightlifting applications, Sport-speed development, Explosive training, and CHAOS™ Speed Training.